Dr. Pamela Stephens was hired by the Adair County School district in January as a temporary interim superintendent, but at the June monthly meeting of the school board, she was nominated for a full-time four year contract starting July 1 through June 30, 2021 and Dr. Stephens happily accepted the board’s nomination. Stephens will serve a four year term with a salary of $126,250 per year. Stephens has spent the entirety of her career working as an educator in the state of Kentucky. She’s taught, supervised, or been a counselor in several different school districts and she’s even taught at the collegiate level for Campbellsville University and Western Kentucky University. Stephens taught for 16 years in Adair County serving in numerous positions across the county. Stephens was the middle school math teacher at John Adair Middle School. She was the first special education director of Adair County and provided oversight to Sparksville, Colonel William Casey, and Shepherd elementary schools as a supervisor. Stephens settled down in Adair County in 2014 after retiring from 21 years of service as superintendent of the Westpoint school district in Hardin County. Several family members, friends, teachers and staff were at the monthly meeting and witnessed Dr. Stephens accept the board’s nomination. 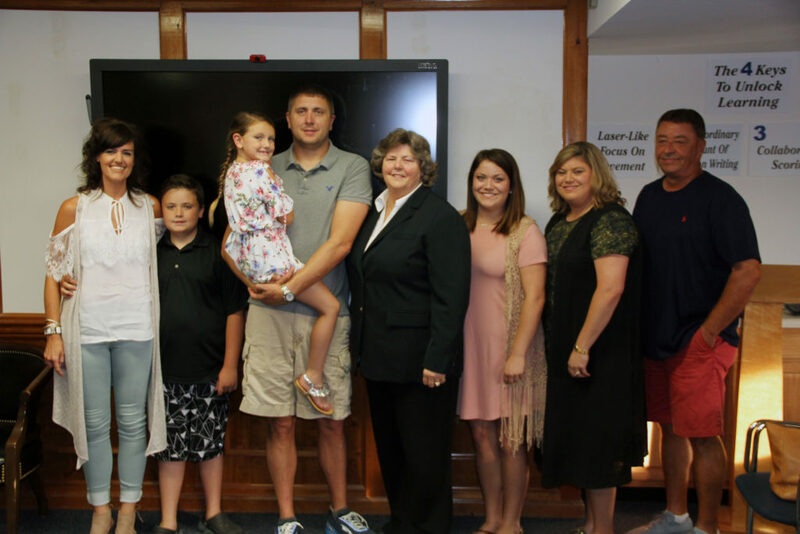 (from left) Lindsay, Trey, Raegann and Lee Stephens, Dr. Pamela Stephens, Meridith Corbin, LaGene and Mendel Sexton.